Be the first to review this 2018 Nissan Titan XD. The Nissan Titan XD is a semi-heavy-duty pickup, heavier-duty than a 1500-class half-ton truck, but lighter-duty than a 2500 three-quarter-ton. Titan XD shares little of the hardware of the regular Titan, such as the frame or chassis pieces, instead it is built on a heavy-duty boxed and gusseted frame, with cabin isolated from the chassis on hydraulic mounts. The Titan XD is smoother than the heavy-duty Ford F-250, Chevrolet Silverado 2500 and GMC Sierra 2500, and Ram 2500, but rides rougher than the light-duty F-150, Silverado 1500 or Ram 1500. It has a stout powertrain, either a 390-horsepower V8, or turbodiesel V8 boasting 555 foot-pounds of torque. It comes as rear-wheel drive, or four-wheel drive. For 2018, there’s a new Midnight Appearance package. Titan XD is rated to tow 12,000 pounds, give or take a bit depending on engine; we found it can comfortably handle 9,000-pound trailers. The bed is 5 feet 6 inches, whether Single Cab or Crew Cab, and the payload capacity is 2600 pounds, truly heavy duty. The Titan XD can handle a snowplow, although a manual transmission is not available. Nissan might be a Japanese company, but the Titan XD is basically an American truck: designed in California, engineered in Michigan, tested in Arizona, and built in Mississippi. The V8 engines are built in Tennessee, while the diesels are built in Indiana. There are two engines available: a 5.6-liter V8 making 390 horsepower and 394 pound-feet of torque, mated to a 7-speed automatic transmission; or a 5.0-liter Cummins turbodiesel V8, with a heavy-duty Aisin 6-speed automatic transmission. The Cummins makes a fairly light 310 horsepower but pulls like a train, 12,310 pounds, using its 555 foot-pounds of torque at 1600 rpm; it’s also a costly engine. That’s a lot of torque, though it’s still less than what’s offered by the heavy-duty Ram, Ford and Chevy diesels. The Cummins is the towing machine, set up for a gooseneck trailer, and for installing the ball and chain anchors very quickly. The standard rearview camera sees the hitch ball, very helpful when hooking up to a trailer. The camera was designed with this task in mind. All XDs also come standard with a trailer-brake controller that makes stopping smoother and more accurate than with an aftermarket setup. Inside, the cab is comfortable, with supportive seats. The single cabs are work trucks, with a bench seat in the base model, while crew cabs offer luxurious passenger travel with everyday practicality. Each model upgrades the upholstery, from fabric to vinyl to plush leather on the Platinum Reserve. The navigation screen is small, but standard surround-view cameras help in tight places, along with cross-traffic alerts when backing up, and front and rear sensors when parking. Underway, Titan XD feels tall, but crisp, taut, more agile than other heavy-duty pickups, although that’s probably not saying a lot. We might also say it handles like a sub-continent. The suspension is relatively firm and controlled, and the steering is direct. Titan beds have a tie-down system that makes securing various cargoes easier, and available rails make it even easier. Locking storage boxes are optional. The tail gate is damped and opens smoothly and lowers easily, instead of slamming down or requiring muscle to lower it gently. 2018 Titan XD Single Cabs come in S ($31,090) and SV trim ($34,990) with gas or diesel engines. The Titan XD is tidy and attractive, with styling that helps make it look smaller than it is. The Titan XD closely resembles the regular Titan. It looks a bit like the Ford F-150, although it’s one inch taller. The XD grille is bigger and blunter than that on the regular Titan, while being showy and clunky compared to rivals. It’s nearly 19 feet long, with a wheelbase of 151.6 inches, and a width about the same as rivals. Lights mounted low in the bed illuminate the contents, even when a bed cover is installed. The cabin is nicely designed, with large controls that are user friendly. The navigation screen is small, but the rearview camera is clear, and the surround-view cameras make maneuvering in tight spaces easier. Cubby storage is plentiful, including big console storage. We haven’t tried the bench front seat, which adds another passenger to the seating capacity, but the bucket seats are supportive and comfortable. However climbing into the Titan XD requires more of a lunge than with other heavy-duty pickups, namely the all-American ones: Ford, Chevy and Ram. It’s nearly three inches taller than the Ram 1500, which might make a difference on the step-in, for that one. But the XD’s height is the same, whether 2WD or 4WD. Crew Cabs offer full-size, front-hinged rear doors that open wide to reveal roomy, comfortable back seats. Storage is available underneath, and the rear seats fold down to a flat load floor, though that floor is too high for a big dog. The Titan XD uses a much heavier frame and chassis bits than the Titan. It might be seen as semi-heavy duty, but for all practical purposes, it will do everything a three-quarter-ton truck in the F-250 class can do. We found the Titan XD quite capable hauling a heavy load, or pulling a 10,000-pound gooseneck trailer. If you need more towing capability than what the XD can handle, you’ll need a truck in the F-350 class. Both engines are strong and extremely capable, although the 5.6-liter gas V8 is a bit aged. It makes 390 hp and can tow 11,270 pounds. It’s pretty quiet, although the 7-speed automatic transmission can be slow to kick down when acceleration is needed. The 5.0-liter diesel starts easily, even in cold weather, by inserting the key then pressing a start button. It rumbles pleasantly at idle. From outside, the traditional diesel clatter can barely be heard. This Cummins sounds confident, not loud and clattery like the 5.9-liter inline-6 used in earlier Rams. Underway, the diesel is smooth and delivers strong pulling power. The two-stage turbo is tuned well to provide easy cruising over the flatlands or strong acceleration. It comes with a heavy-duty Aisin 6-speed automatic controlled by a column shifter, with a rotary dial for two- or four-wheel drive. The XD uses a double-wishbone suspension in front, and leaf suspension in the rear, the bits beefed-up over the regular Titan’s. The rear uses twin-tube shocks and an American Axle differential with an available electronic locker. The ride is smooth, but not creamy as rivals like the Ram, with optional air suspension. It feels somewhere between Chevy Silverado 1500 and Silverado 2500. It steers well, while basically handling like the 19-foot-long, 5,000-pound behemoth it is. Titan XD is set up for a fifth-wheel or gooseneck hitch; it’s very easy to pop the plugs in the bed, and plug in a ball hitch. Then, back up to a gooseneck trailer using the cameras to locate, lower the trailer onto the ball, hook the chains through, and off you go to the races. But before you drive off, stand behind the trailer, press a couple of buttons on the key fob, and a test sequence will initiate allowing you to observe all the brake lights and turn signals are working. It’s a fantastic feature. The trailer mirrors are effective, if on the small side, with a convex mirror below the flat mirror. They can be extended manually, by standing outside the truck and pushing on them, not as convenient as the power-extendable mirrors on the F-250. The mirrors tilt down when the truck is in reverse, a feature we seldom appreciate. 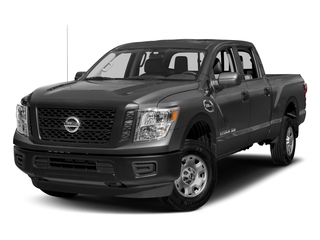 The Nissan Titan XD is an excellent choice as a heavy-duty hauler, or tow truck for trailers weighing less than 9,000 pounds. It’s more agile than trucks in the 2500 class, and rides a bit better, so it’s a good fit between a half-ton and three-quarter-ton truck. There are no bad choices among the heavy-duty pickups. Mitch McCullough is editor-in-chief of New Car Test Drive.